Stadium and legend between frieze of ancient Greek athletes, Goddess Columbia and Athena at sides. A new design was required for the Diplomas. Many artists submitted sketches, and for more than a year proposed designs were examined, but none were found fully satisfactory. 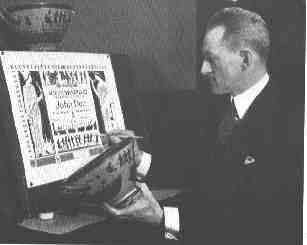 The Committee finally went to Mr. H. M. Kurtzworth, Art Curator of the Los Angeles Museum, to enlist his help in producing an appropriate design. He was immediately interested and undertook the task himself. 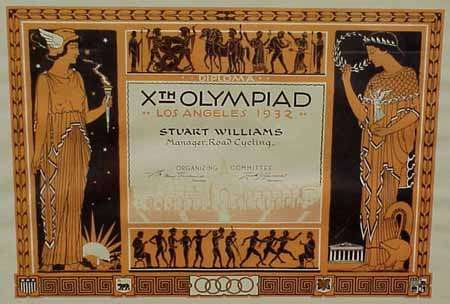 The design, the color scheme, and many of the details of the Diploma were directly inspired by the classic art of the Greeks, through examples of vase painting found, for the most part, in the Victor Merlo Collection of Classical Antiquities in the Los Angeles Museum, dating back to the period of the beginning of the ancient Olympic Games. The border of olive represents the branch of sacred leaves taken from the tree within the temple walls, the highest award any man could receive in the Games, or for service to the State. Columbia, the modern Athena, symbolizing the United States of America, with the torch of the Olympiad in her hand, stands in an attitude of welcome to the nations of the world. She is clad in the Doric chiton and wears the Phrygian cap of freedom on her head. The stars of aspiration, and the rising sun of progress form her background, and at her feet the mountains, the palm and orange groves, and the Los Angeles City Hall, symbolize the State and City of the Xth Olympiad. Athena, the Olympian patroness, goddess of civic virtue, the arts, victory, and the home, represents the ideal of the Olympic Games, wherein athletics and the arts of war were practiced to insure adequate protection and full enjoyment of all the arts of peace. The goddess is garbed in the classic chiton and himation. About her shoulders in the aegis or scaly skin of a monster, indicating her power over enemies of man. On her brow and in her hand are victors`wreaths of sacred olive and she also holds a statue of Nike, goddess of victory. Athena`s shield and spear have been omitted, for here she appears practicing the arts of peace, but at her feet is shown her war helmet. In the distance is the Temple of Athena at Athens. The Olympic Stadium, appearing as seen by contestants from the middle of the arena, shows the entrance surmounted by the Olympic Torch amidst flying flags and thronged spectators. The frieze at the top of the Diploma represents various aspects of the Games as depicted on vases of the Sixth Century, B.C., - a judge; a contest in full armor; equestrian sports; drama, music and the dance; flanked by another judge, spear in hand. The lower frieze represents other aspects of the classic Games; a seated judge; physical examination as prescribed both before and after contests; a discus thrower in the first position, from a vase in the Munich Museum; a javelin thrower, from a vase in the Boston Museum; the finish of a race, as depicted on an original Olympic trophy vase of the Fifth Contury, B.C., in the Los Angeles Museum; and a judge making a decision, from the same vase. The lower border is composed of the typical Greek "fret," meander, or "key" motif, embellished with the coasts of arms of the United States and of the State of California, the Olympic insignia, the symbolic grapes of Los Angeles County, and the four flags showing the historical development of the City of Los Angeles. The terra cotta and black color scheme was inspjired by Fifth Contury vases in the Los Angeles Museum.